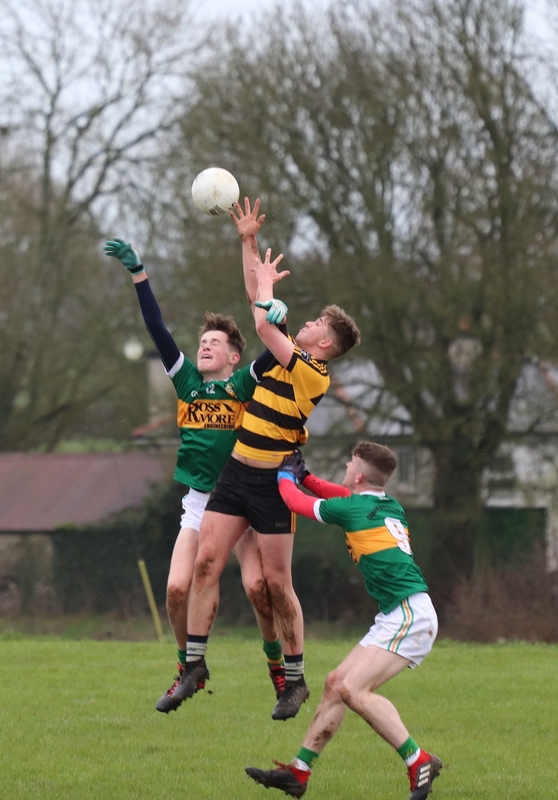 A late Cathal Bourke pointed free in injury time saw Clonoulty/Rossmore and Arravale Rovers finish all square in the second round of the McGrath Oil West U21A Football Championship on Sunday last in Clonoulty. Two minutes previous Matthew Moroney had kicked Arravale into a one point lead as they looked to take victory that at certain times in the game looked beyond them. An earlier shower cleared for a dry crisp day with temperatures somewhat rising from the previous few days. The first half belonged to Clonoulty/Rossmore as they limited Arravale Rovers to just a single point. Clonoulty/Rossmore were strong in defence and attacked patiently though probably should have added more on the scoreboard. Nathan Slattery opened the scoring for Clonoulty/ Rossmore after three minutes with a well taken , but it would be another eight minutes before the next score when Tommy Ryan opened his account. They limited Arravale Rovers in attack forcing some good turnovers and probably should have been further ahead at this stage. Jack Hogan opened the Arravale account on the quarter mark as they tried to get a foothold in the game. Jimmy Ryan Con extended Clonoulty / Rossmore’s advantage before Padraig Carew broke through the Arravale defence only for his shot to go across the face of goal and wide. Aidan Loughman kicked the last point of the half with six minutes remaining to see Clonoulty/Rossmore lead 0-4 to 0-1 at the break. Seven days ago a strong second half performance from Arravale saw them come back for an unlikely win. Today they took a bit longer to get going in the second half but gradually found their way back into the game. Nicky Kearns extended Clonoulty/Rossmore’s lead on the resumption with a point. Arravale were slowly getting into the game, finding more space, and creating more chances though their accuracy was off. Dean Morrissey eventually got them off the mark in the half when he volleyed the ball over the bar. Aidan Slattery quickly cancelled it out at the other end. The game now started to find a flow. Conal Donovan blazed over the bar in what was certainly a goal chance and Cormac Maher fired over his first to cut the deficit to just two points with twelve minutes to play. Clonoulty/ Rossmore were creating plenty of chances but were guilty of dropping their shots into the goalie’s hands. The game was level by the twenty fourth minute after Cormac Maher pointed a free and substitute Killian Noonan pointed from play. It set up a very tense finish. Cathal Bourke pointed a free to see Clonoulty/Rossmore one up but Johnny Ryan powered through at the other end to level the game. Matthew Moroney looked to have kicked the winner for Arravale but in the last attack Clonoulty/Rossmore won a free which was pointed by Cathal Bourke. Sean Bradshaw blew full time from the resulting kick out to see the teams finish all square. Aerial Battle! Jack Ryan (Clonoulty/Rossmore) and Conal Donovan (Arravale Rovers) in the McGrath Oil West U-21 A Football Championship game played at Clonoulty last Sunday. Clonoulty/Rossmore were best served by Odhran Quirke, Jimmy Ryan, Aidan Loughman and Nathan Slattery while Jack Lowry, Oscar O’Dwyer, Matthew Moroney and Killian Noonan caught the eye for Arravale. Subs used; Aidan Slattery, Oisin Fryday, Paddy Ryan, Nicky Mockler. Subs Used: Killian Noonan (0-1), Brian Roche, James Cussen. Referee: Sean Bradshaw (Knockavilla Donaskeigh Kickhams). Cashel King Cormacs got their McGrath Oil West U21A football championship back on track when they came with a late run to defeat Galtee Rovers in this round two game played in Cashel on Sunday last. It took the introduction of Eoghan Connolly at the break to change the pattern of this game and get the Cashel King Cormac attack perform to their ability. His own contribution of three points aligned to his linking up with Ross Bonnar and Brian Fitzpatrick went a long way in ensuring a home victory. Galtee Rovers led this game from the third minute until the 69th and will rue conceding two late goals. Galtee Rovers got off to a great start in this encounter with Adam McGrath finding the net after three minutes from the penalty spot. Brian Fitzpatrick cut the deficit from a placed ball, to open Cashel’s account. Both sides were then guilty of wayward shooting, but Adam McGrath who was always threatening in the Galtee attack, scored a point from play before setting up Evan Breen for their second goal after twenty minutes to push their advantage out to six. Two further points from Alan Flannery and Daire Egan put them in a commanding position. However Cashel came back with points from Ross Bonnar and Daniel Wade to leave the scores at the break, Galtee Rvs. 2.3, Cashel King Cormacs 0.3. Cashel introduced Eoghan Connolly at the break and his introduction quickly paid dividends. He kicked the opening two points of the half within four minutes. Ross Bonnar and Conor O’Dwyer added two more to narrow the gap to two. Adam McGrath steadied Galtee Rovers with two further points, one from a free before Aaron Moloney put over for Cashel, who by this stage were well back in the game and their attack, led by Connolly, always threatening. Adam McGrath and Ross Bonnar exchanged points to keep three between the sides with ten remaining. The last ten minutes were all Cashel. Brian Fitzpatrick kicked a wonderful point but an Adam McGrath point kept Galtee three points clear with the clock ticking down, A late Cashel surge saw Connolly put over a free to narrow the gap and Brian Fitzpatrick rattle the net to put them one up with a minute remaining. Cashel pressed up on the Galtee kick out and Conor O’Dwyer got on the end of a move to finish to the net for a score that would ensure their progression to the knockout stages of this championship. Subs used; Eoghan Connolly (0.3,1f), Fearghail O’Donoghue. Galtee Rovers: Darragh Kennedy, Edmund Burke, Jim Quirke, Keelan O’Connor, David Harold Barry, Kilian Byrnes, Tony Byron, Evan Breen (1.0), Daire Egan (0.1), Eoghan Brennan, Alan Flannery (0.1), Sean Dowdall, Eamonn Quirke, Adam McGrath (1.5, 1.3f), Owen Pyke. Referee. Phil Ryan (Knockavilla Donaskeigh Kickhams).